No matter if you are going to update the already launched web resource or bring a new project to the web, you are likely to be looking for trendy and stylish solutions that will help your resource shine. In the showcase that we share below, you can find the 15 most popular and trending flagship themes from TemplateMonster compatible with the latest versions of the world-known platforms. 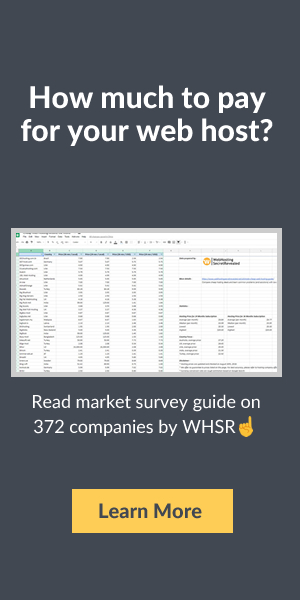 So, if you run a website on WordPress, Joomla, HTML5, Magento, OpenCart or PrestaShop, you are likely to find a design that matches your preferences. The inventory of ready-made themes from TemplateMonster counts more than 26,000 for various purposes. More and more often you can notice multipurpose templates being added to the marketplace. The demand on such themes grows at a fast rate. Fit-it-all designs come loaded with every piece of functionality suited to enhance the visual appeal of a site and make it more powerful from the inside. 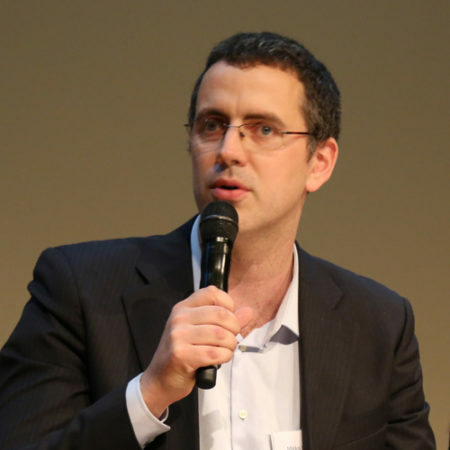 The themes that we will discuss here include various features and are suited for different purposes. However, all of them have special peculiarities in common. All of them are developed as per the latest web tendencies. All of them are well-documented and feature free 24/7support. You can personalize their layouts on your own or ask experts from TM Service Center for help. 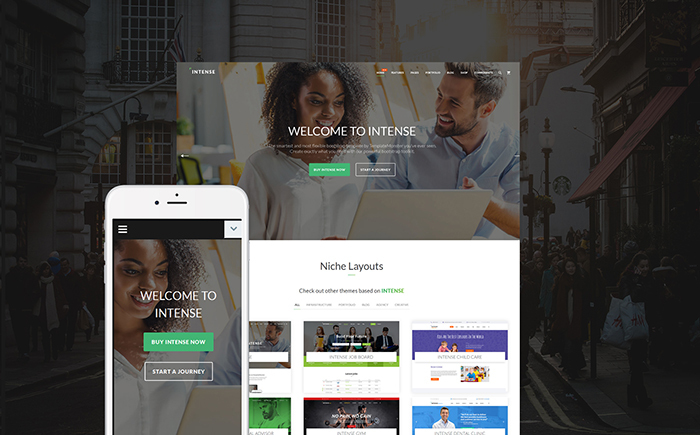 Intense is a powerful and feature-rich HTML5 theme intended to be used for a number of business projects. This is a fully responsive website template that includes a collection of 450+ HTML pages, multiple header and footer layout variations, pre-designed templates for blog/portfolio pages, reusable elements, various sidebar widgets, and a whole lot of other options. The theme includes a rich collection of child skins that are intended to be used for the web resources of different niches. The theme is eCommerce-ready, letting you get started with a full-fledged web store on its basis. 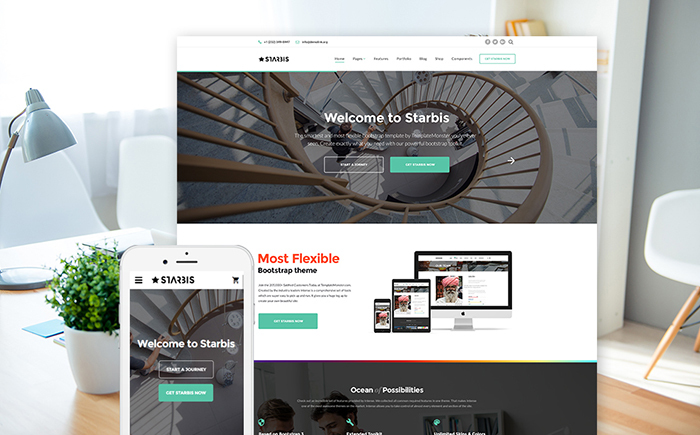 Starbis is a multipurpose HTML5 template suited to be used for both personal and business projects. It includes a growing collection of child skins, which are available to the theme owners at no cost. The theme is powered by the fully responsive Bootstrap framework, which is intended to adjust all components of the layout to all screen sizes. The theme includes collections of header and footer styles, which will help you bring the desired structure to the page layout in the shortest period of time. Starbis is an eCommerce-ready template, which comes loaded with every single element needed to build a web project by means of which you can start selling for profit. 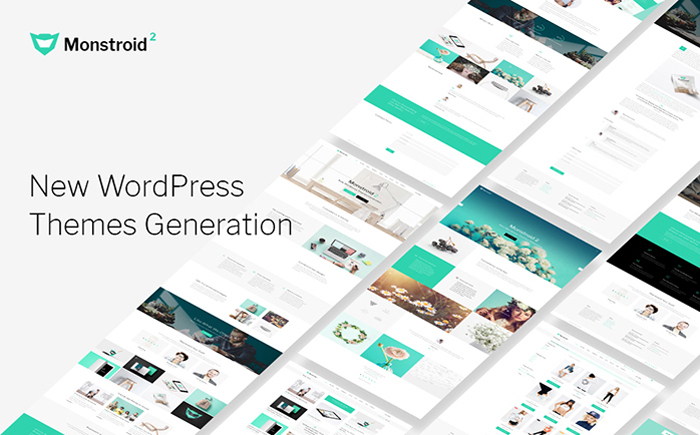 Monstroid Squared is a multifunctional and feature-rich WordPress template featuring a clean and minimalist design. 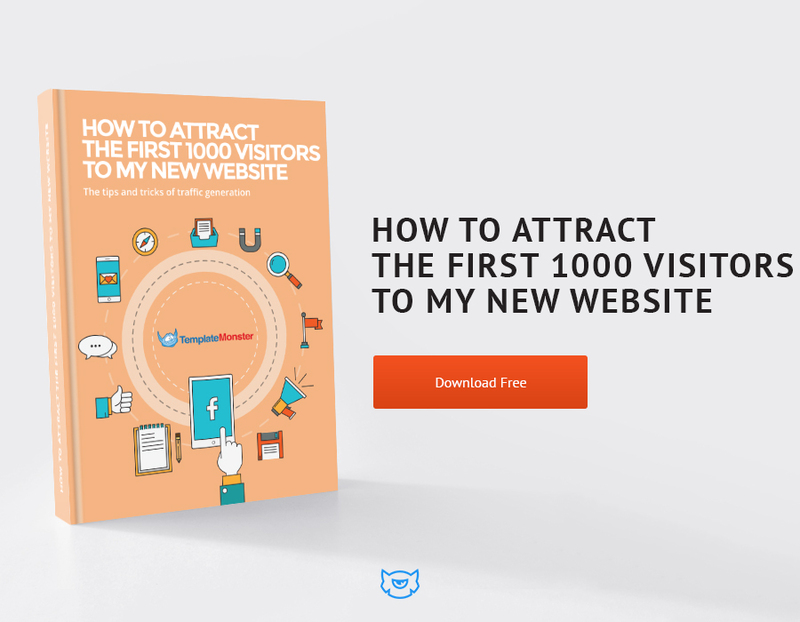 The theme includes free lifetime updates and an ever-growing collection of child templates suited to be used for a number of business niches. The theme includes eCommerce integration, letting you launch a full-fledged web store on its basis. Collections of ready-made pages and pre-designed layouts are included to streamline the process of the theme customization. The theme runs on Cherry Framework 5 and includes a number of custom Cherry extensions. Premium-quality plugins are included for free use. Thanks to the integration of Jetimpex Dashboard, you can rest assured that the most valuable pieces of data and settings will be always backed up and protected from malware. Woostroid WooCommerce template includes every single feature needed to build a full-fledged web story. It supports both WooCommerce and Ecwid plugins. Owing to the regular and free lifetime updates, you will always have the most innovative options for running a profitable online business. 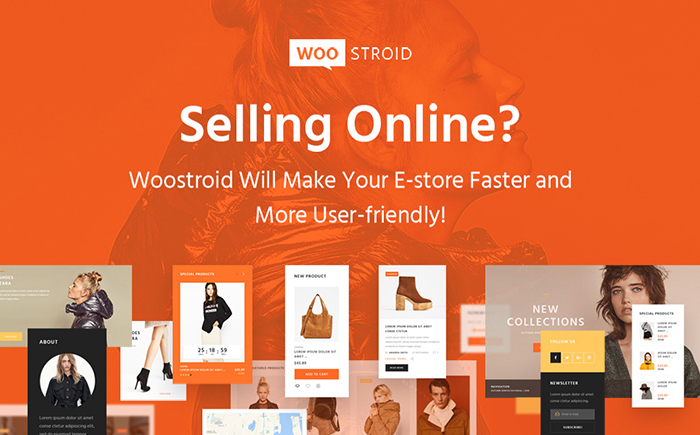 Woostroid includes a growing collection of demo themes, which are intended to be used for tools, jewelry, lingerie, and other topics. The number of the niche skins is set to grow with the release of every consecutive update. With the purpose to make it much quicker and effortless to personalize the pages of the theme, webmasters are provided with free access to the Power drag-and-drop page builder and a number of content modules. WordPress Live Customizer is included to reveal the results of the theme modification in real-time. 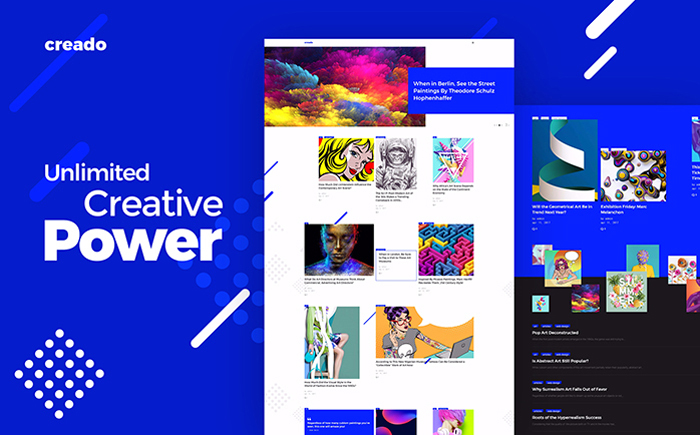 Creado WordPress theme will appeal to those users who are looking for a creative and functional starting point for art gallery websites. It is powered by the Grid CSS technology, which lets you organize different types of content in a non-standard style. WordPress Live customizer is added to reveal the results of the theme modification in real-time. 7 header styles, multiple custom widgets and content modules are included for free. The theme runs on Cherry Framework 5. A fully responsive Bootstrap-based framework makes every piece of content shared on the web page fully adaptive to the screens of all handheld devices. 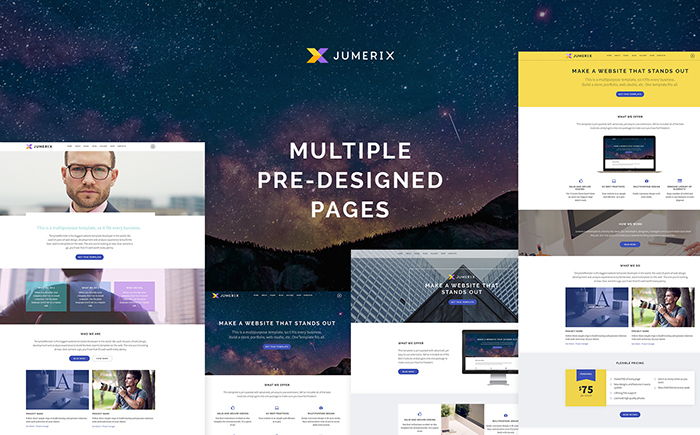 Jumerix is a multipurpose Joomla theme that can be used to match a number of business purposes. With it help, you can get a blog, business studio or online portfolio live in the shortest period of time imaginable. All elements of the theme’s design are fully responsive and 100% editable. A rich UI kit is included to let you save time on creating custom designs for different design elements of your site. The theme includes a collection of multiple homepage layouts and ready-made pages for you to choose from. Swiper slider and video integration are added to bring an eye-catching presentation to different pieces of content on your site. 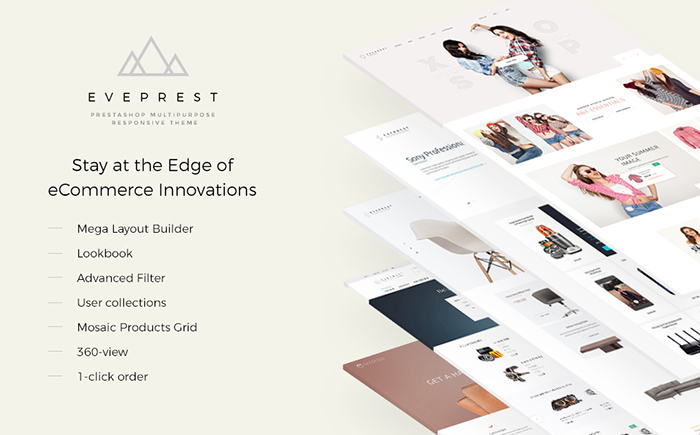 Eveprest PrestaShop web theme is a superb way to attract more attention to your business or personal project. This is a multipurpose ready-made design that will be suited for selling fashion, beauty, jewelry, electronics, furniture, and other items on the web. The template includes a collection of 10 niche skins for various purposes. Web site content will be really easy to read due to lots of negative space and clear structure. Personalizing the pages will be a child’s play owing to TM Mega Layout builder. This is the best solution that supplies quick and smooth web development. 10+ premium modules are added for free use. The theme is fully responsive, thus it will not be difficult for you to attract site visitors throughout the world. If you have any inquiries on the subject of template usage you can have a look at the rich documentation, also you receive 24/7 priority support helping to get rid of any issue. 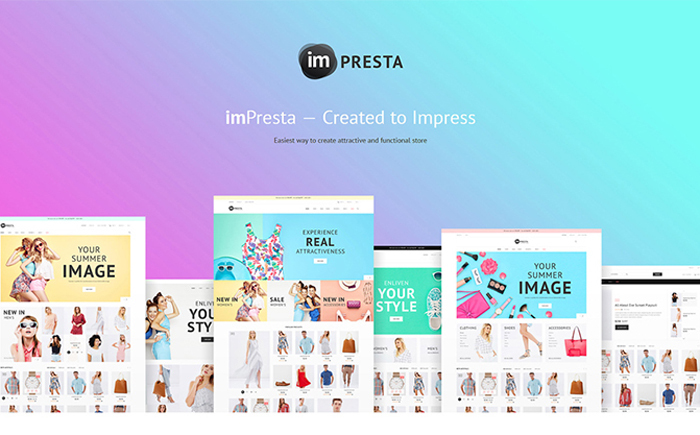 imPresta is a multipurpose PrestaShop theme that comes enhanced with a unique set of features suited for multiple purposes. Thanks to the integration of TM Mega Layout Builder and Mosaic Product module, you can tweak the pages of the site without touching a line of code. The theme includes a collection of exclusive premium modules, which you can use at no cost. 6 niche-specific skins are ready to be used for food, accessories, tools, cosmetics, toys, and bikes shops. There are also three pre-built product layouts for you to choose from. Advanced navigation and product sorting options are included alongside with a number of stunning product presentation options. 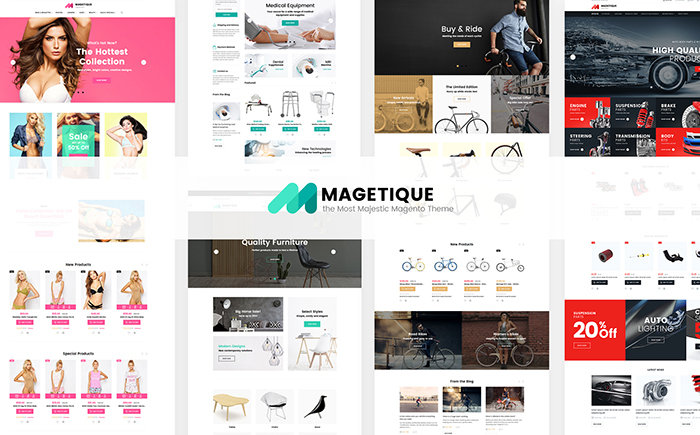 Magetique is a versatile eCommerce theme powered by Magento 2. This is a feature-rich solution that is enhanced with every single piece of functionality and extensions needed to get started with a conversion-oriented web store. The theme includes a collection of more than 20 premium extensions for free. 5 ready-made layouts are suited to be used for fashion, cars, electronics, and other purposes. All elements of the template are fully editable and can be tweaked by means of ready-made layout options and advanced customization tools just the way you want. 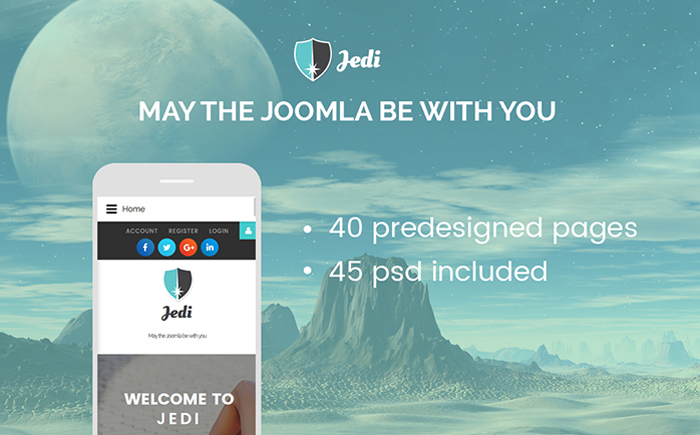 Jedi Joomla theme allows making a highly effective introduction to your business on the Internet and encourages people to explore more of your content. It is intended to become a rock-solid starting point of small to large-sized business web projects. Introducing extra style to the page’s visual appeal, this specific web template maintains equilibrium with well-positioned blocks that allow focusing on the content. This is a fully editable template containing 40 pre-designed pages and multiple header & footer variations. Thanks to its totally responsive layout, your web page will successfully adjust to the size of any display used to view it on. Neat, valid coding and comprehensive documentation will aid you in transforming this Joomla web design just how you need. 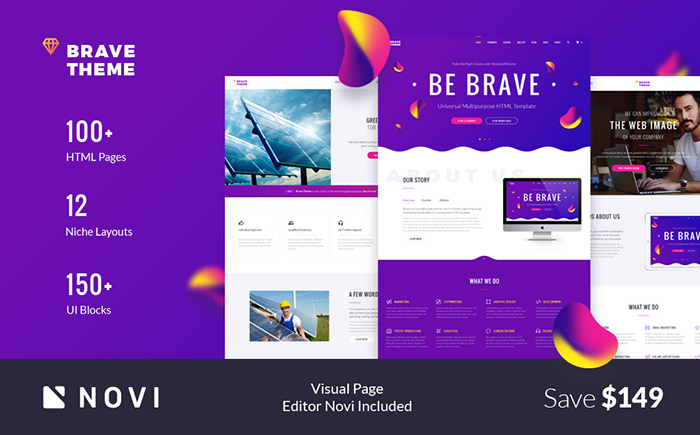 Brave multipurpose HTML5 theme is a fit-it-all solution that is intended to be applied to a number of business and personal web projects. The number of pre-designed pages and UI blocks simply impresses. Downloading the template you will be able to access all visual and functional elements needed to make your web resource an attention-grabber. Brave is integrated with Novi page builder. This is a revolutionary visual page builder that allows you to craft versatile web pages as you simply drag and drop multiple elements. The theme also includes multiple widgets suited to share different types of content on the pages of your site. Intended to be used by beginner and pro web developers equally well, the theme makes it possible to launch a powerful web resource without investing a fortune in premium features. 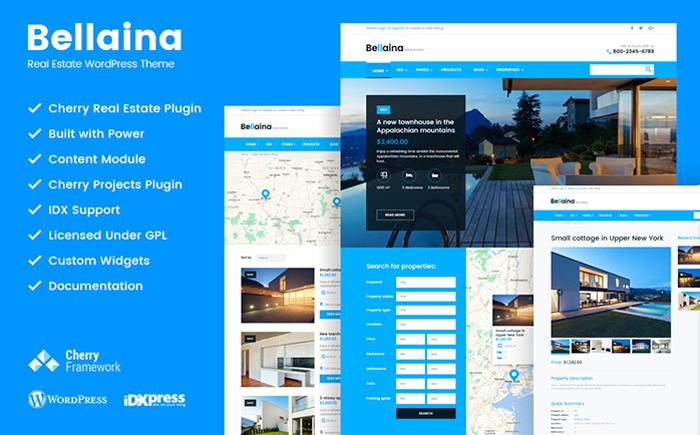 Bellaina is a full-fledged WordPress template intended to be used for property selling websites. It includes GPL license, which gives you the freedom of its modification in any way imaginable, as well as installation on as many web resources as you wish. The theme runs on Cherry Framework 5 and includes a number of a number of advanced Cherry options. It is also loaded with premium extensions, which you can use at no cost. For example, Cherry Real Estate plugin will bring advanced property search filters to your site. There is also an option to reveal search results on the integrate Google map and send property submissions to agents. Kustrix theme is best suited to be used for fashion and beauty blogs. This is a functional WordPress template featuring GPL license. A clean and spacious layout of the template is intended to provide the web audience with the unparalleled UX. The theme is well suited to present content-heavy projects on the web. An easy and intuitive interface will be handled by the users of all skill levels perfectly well. Site visitors will definitely appreciate the pleasant user experience provided by easy-to-use navigation and smart arrangement of the layout. Responsive layout usually means that your web project will rapidly adapt to any device and any display dimensions. Richly documented and featuring cost-free round-the-clock assistance, this website template will help you get moving with your Internet project in no time. 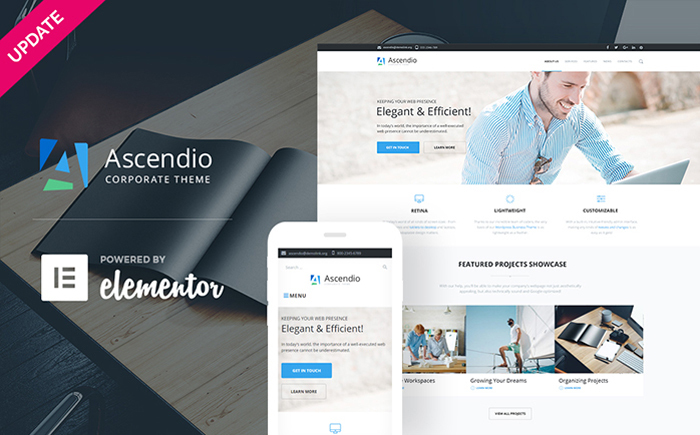 Ascendio is a ready-made WordPress theme that will help you build a powerful and full-fledged corporate web page. It is loaded with the revolutionary Elementor page builder, which allows you to tweak the theme’s layout without touching a line of code. The theme can be used for both corporate purposes and eCommerce web projects. A number of header and footer variations are included to bring a fresh and stylish look to your site. A number of custom extensions are included at no cost, letting you save extra cash on the promotion of your business. Thanks to the integration of WordPress Live Customizer, bringing changes to the theme’s layout won’t take you too much time. 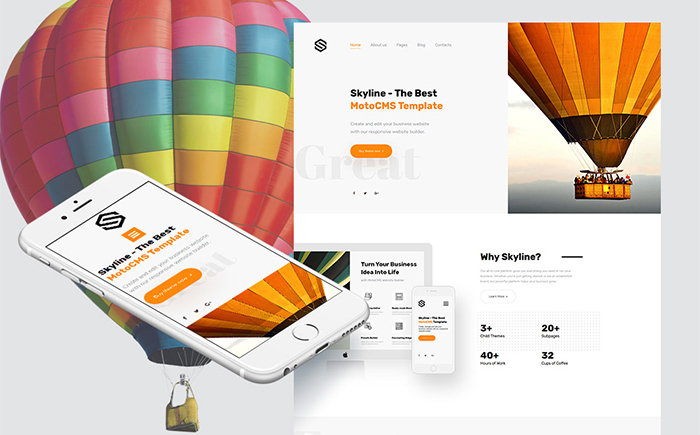 Skyline is a multipurpose Moto CMS 3 template that can be adjusted to any purpose of yours. It includes a collection of 5 homepage layouts for different niches, 3 child themes, and 2 variants of the main theme. The theme is built with an intuitive drag-and-drop page editor, which frees you from the necessity to tweak the source code whenever you want to bring changes to the layout. The theme includes regular updates, which will provide its owners with new fonts, more pages, and additional possibilities of White Label.